Brexit is far from a done deal. Against a continuous background of public dissent from those who wish to stay in the EU, the Government are in meltdown; EU negotiations have ground to a halt, public opinion is moving away from leaving; and business and media commentators are delivering dire warnings for the future. Should we accept the referendum result or fight it? The argument over the UK’s membership of the EU did not end in July 2016 any more than it did when we entered in 1975. Citizens have a democratic right to speak out, to be able to campaign for their values; never more so than when those values are under threat. And Brexit represents an existential threat to the inclusive, tolerant, diverse and fairer UK that many of us aspire to live in. Given the evidence that has now amassed about campaign overspending, data abuse, foreign interference and the microtargeting of susceptible swing voters with xenophobic and anti-EU propaganda, not to resist Brexit would be to surrender democracy to the elites who paid for the Leave campaign and who will be the only true beneficiaries of leaving the EU. Remain is resisting, and nowhere more strongly than Brighton and Hove. 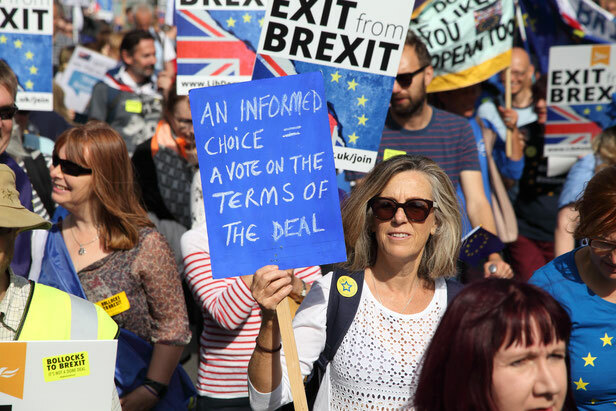 Petitions, demonstrations, stalls, leafletting and letters, news and views voiced on social media; they all contribute to keeping debate alive. But are politicians really listening? Is the clamour enough to count? How can we best use our efforts to oppose the disaster that is unfolding? There is still time to reverse Brexit, but campaigning efforts will need to act in concert and the cumulative effect must aim to achieve more than the sum of the parts. Parliament is the body with the power to bring the chaos to an end. But too many politicians have abdicated their appointed role as democracy’s trustees, pledging allegiance instead to the “will of the people”. This mantra conveniently glosses over the fact that the referendum was won by the narrowest of margins and that millions of those most affected were disenfranchised from the crucial vote. Politicians, it would seem, crave a mandate from the people for their programme. Committed to that rationale, it will take another referendum to change their course. Despite substantial evidence of the damage that Brexit will wreak, the government as yet shows no sign of asking for a renewed mandate itself. It seems to prefer the prospect of crashing out than changing course. Nevertheless, it cannot deliver to the satisfaction of all factions, and as bad news and opposition accumulates, it may have no alternative but to call another referendum. A second referendum would need to address the flaws in the original. It should be a vote on clearly defined, available options and set a clear threshold for a win. Its rules should explicitly disqualify wins achieved by illicit means. Above all, it should extend the franchise to 16-17 year-olds, EU citizens, UK citizens abroad and other groups directly affected by the outcome. A second referendum remains the single best opportunity reverse Brexit. For that reason, it is the goal and focus of many of the important Remain campaigns and political parties including People’s Vote, The Green Party, Liberal Democrats, SNP, The Independent and Best for Britain. Pushing for a referendum on the deal, and at the same time supporting initiatives to embolden Remain MPs to speak and vote against the government are our best chance of turning this around.